In November 2017, The Laundromat Project launched our Community Artist Residency. Out of our Kelly Street Collaborative space, Bronx-based artists and collectives can engage with Hunts Point/Longwood residents through 3-month, interactive projects. Our inaugural artist-in-residence was Designing the We, a for-benefit design studio with members based in the Bronx. They installed an exhibition “The Big Rethink” in our Kelly Street Collaborative space, designed to challenge local residents and visitors to imagine novel approaches to reclaiming their neighborhoods and public space, especially in the context of City Council’s recent approval of the Bronx’s Jerome Avenue, and ongoing issues with New York City Housing Authority (NYCHA). “The Big Rethink” was personally significant for Designing the We’s co-founder, April de Simone. While growing in the Tremont section of the Bronx, April experienced a built environment negatively shaped by urban planning policies intended to perpetuate inequality and disparity—especially in communities of color. 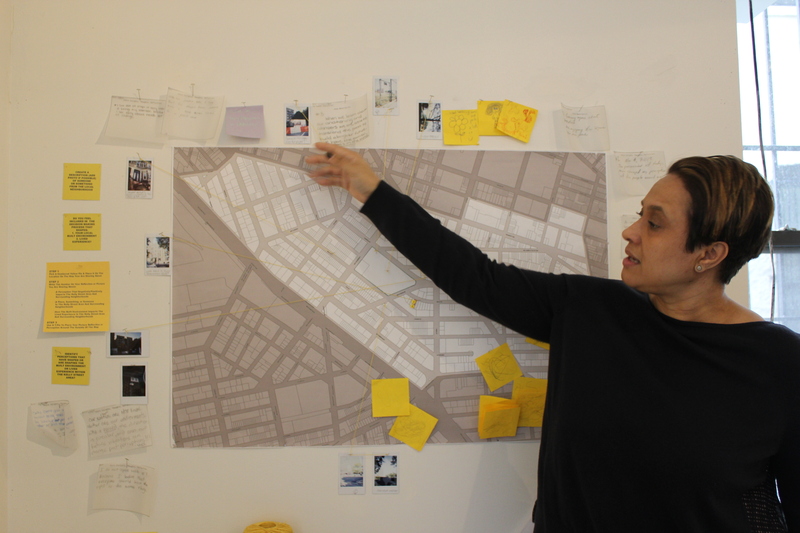 April and the Designing the We team believe that learning, understanding, and sharing this history of how communities reach “a point of gross inequity and disparity” is important in light of the development, gentrification, and displacement currently happening throughout the Bronx. The Big Rethink’s “A View from Kelly Street” section, which comprises of archival photos, maps, and research. For April, “it was great to hear the youth share their different perspectives, and more importantly how they have the power to control narrative through documentation and archiving, which is what the section ‘A View from Kelly Street’ [was] about.” This part of the exhibition was designed as a living archive of the neighborhood for local residents. As participants discovered connections between the history of policy and zoning and subsequent development or demolition in the area around Kelly Street, they contributed documents, photos, and notes from their own research and stories to the archive. Though Designing the We’s 3-month exhibition and project at the Kelly Street Collaborative ended in January 2018, the team plans to expand “The Big Rethink” and its archive section to new sites in the Bronx. Each satellite site of this exhibition will also feed into Designing the We’s NYC “WeLAB” permanent exhibition space at Andrew Freeman Home home, which is where April and her team will continue to learn, map, design and connect with neighbors, institutions, professionals, and beyond.